The Academy’s facilities are designed to prepare you for a career in music production and sound design. Our hands-on learning environment in the recording studio creates a culture that supports curiosity, investigation, and production. Learning to use the software, tools, and equipment used by the industry is essential to preparing you to enter the workforce. That’s why we make it a point to keep our facilities as up-to-date as possible with current advancements in technology and equipment. Create pristine vocal recordings for voice-over, ADR, music sessions, and more in our new ADR room, featuring a wide array of great vocal microphones. In addition, the Academy’s partnership with One Union Recording Studio promotes students’ professional growth by offering access to real-world facilities. Each student gets their own workstation desk with headphones, a MIDI keyboard, and an iMac computer fully loaded with the latest sound and music production software. Practice on our Avid S6 Mixing Console, a control surface fully integrated with Pro Tools software in our surround sound classroom. Take advantage of our full-featured, professional recording studio with an isolation booth, outboard equipment, and surround sound monitoring. The School of Music Production and Sound Design for Visual Media has a new Virtual Instruments Lab with professional level equipment and software, including leading computer and audio interfaces, high-end audio monitors, and samples and software from Vienna Symphonic Library, East-West, and Spectrasonics (Omnisphere). 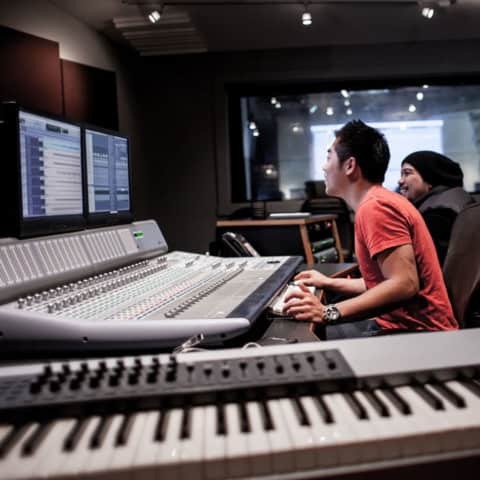 This lab allows students to use the highest grade professional gear to create orchestral and electronic music scores for films and other visual media.